News from the Library: Trial access to Springer Engineering e-books - test it and let us know! In the theory of the Standard Model, the masses, interactions and physical states of quarks – the basic constituents of matter – are described mathematically by a matrix known as the Cabibbo-Kobayashi-Maskawa (CKM) matrix. Three angles enter into the definition of the elements of the matrix. If their sum is not 180°, new physics might be the reason. A typical LHCb event during the recent proton-lead ion run. The LHCb experiment at CERN has measured precisely for the first time at a hadron collider one of the three angles - the “gamma” angle – so far known with the largest uncertainty. It’s a matter of angles: if their sum is not exactly 180°, the geometric shape is not a triangle. And if the angles are those related to the CKM matrix, we enter the realm of physics beyond the Standard Model. Experiments at B-factories have measured the three angles – α, β and γ – but, given in particular the large uncertainty of γ, constraints on new physics are still far from robust. After several months of accurate analysis of data collected in 2011, the LHCb collaboration has been able to improve the precision measurement of the gamma angle, achieving an accuracy which matches that of the B-factory experiments, adding new crucial information for the global fits to CKM variables. LHCb plot of the confidence level of the signal as a function of gamma, for the combination of B→DK modes. The peak of the distribution gives the measured central value and the width gives the error. Quantum physics allows particles to decay to the same final state but through different paths. The probability of these decay modes is directly related to the way quarks mix and interact with each other during the transition. The various paths are mathematically related to the γ angle through a term known by physicists as “interference”. 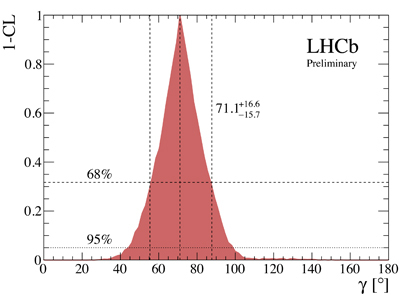 Given the high accuracy of its apparatus and the very good performance of the LHC, the LHCb collaboration has been able to detect the various decay modes of the B particle with high statistics and thus high precision. Using only B→DK results, an unambiguous best-fit value of γ = (71.1 +16.6-15.7) deg. has been determined. Information from B→Dπ decays has also been included in a combination for the first time. When this information is included, the best-fit value becomes γ = 85.1 deg, and the allowed ranges are [61.8; 67.8]° or [77.9; 92.4]° at 68% confidence level. 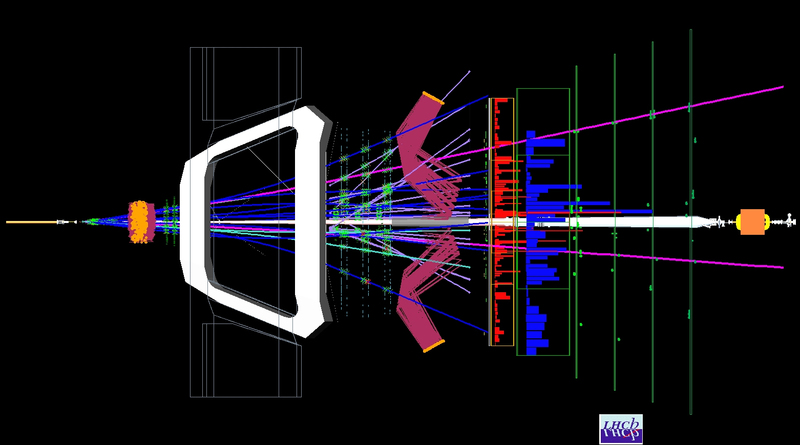 For more information, please visit the LHCb webpage.